Thai Massage is an Eastern healing massage, blended with passive yoga stretches that will nourish tight, achy muscles as it soothes and relaxes the body and mind. In this unique healing therapy, Karen guides you through a series of passive yoga postures, while palming and thumbing along the body's energy lines and pressures points with precise application of hands-on techniques of rhythmic pressure, using patterns of strokes and trigger point therapy. The yoga stretches that are used will help your body release muscle tension, improve flexibility as well as muscle tone, and will help to restore balance and energy within the physical body and mind. The rhythmic hands-on techniques of Thai Massage release toxins as it nourishes the muscles, stimulating the flow of the body’s natural healing properties. Utilizing acupressure and Shiatsu techniques, this unique modality creates a powerful release of stress and tension, as it increases vitality and well-being, restoring the body’s natural balance and health. From chronic pain to emotional stress, Thai Massage reestablishes harmony and wellness from within. ~ Rejuvenates and relaxes the entire body! What can you expect from a Thai Massage session? Thai Massage involves therapeutic techniques that will stretch the muscles, mobilize and bring fluidity back into the joints, and bring oxygenated, nutrient-rich blood more fully into the muscles as it relaxes your nerves and relaxes your mind. Thai Massage is most often done on a padded, floor mat. However, it can also be performed on a table. Table Thai Massage is recommended for people who have difficulties getting down and back up from the floor. Table Thai Massage is also very beneficial when combined with Swedish or Therapeutic Massage. Typically oils are not used in Thai Massage, however, a small amount of a light organic, hypo-allergenic oil may be used for the facial part of the massage if desired. It is also great for Thai Foot Massage! Come to your appointment with an empty stomach and dressed in comfortable clothing that will allow ease of movement and flexibility. Herbal tea is offered as light music plays in the background to help you relax and let go of any mental tension. You will be guided through a series of rhythmic palm/thumb presses, passive yoga stretches, and trigger point therapy that will leave you feeling both calm yet energized. Sessions can be customized to target localized trouble spots. After your appointment, herbal tea (or water if preferred) is offered again as this will help to cleanse and detoxify. You will be shown yoga stretches that will help to preserve the benefits of your Thai Massage and continue to release muscle tension, which in turn will encourage your body to return to a natural state of balance and good health, providing continued benefits beyond your individual session. 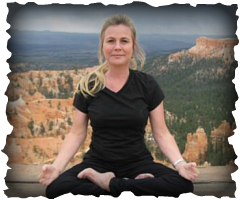 I am a professionally trained Massage Therapist, Yoga Instructor, Reiki Practitioner, & Certified Nutritional Consultant. BUT...more importantly, I am someone who lived too many years conforming to ideas of what I thought I should be doing and what I perceived others thought I should be doing with my life and with my career. As a result, for a long time, my personal life felt like something was missing. My career life in the corporate world was lifeless and meaningless. In 2001, I discovered yoga and did my first yoga teacher training, which in turn, started a chain of events that created huge changes in my life. In 2003, I discovered Thai Massage. I absolutely loved it! I wanted to learn more, so that same year, I studied under the compassionate guide of my first Thai Massage teacher, Jonas Westring, owner of Shantaya Yoga & Bodywork School. Since then, I have been teaching yoga and providing Thai massage to clients, and until Jan 2014, I also worked full time for the US Court of Appeals, when I made the decision to leave my position with the courts to make Yoga and Thai Massage my full time career. In Jan 2014, I left my position with the courts and moved to Costa Rica for 4 months, graduating from the Costa Rica School of Massage Therapy where I trained in a variety of massage modalities that included neuromuscular therapy techniques, myofascial release, trigger point therapy, deep tissue, hydrotherapy, Oncology Massage and traditional Swedish Massage. I spent 3 months in Thailand, graduating from the Thai Massage School of Chiang Mai (TMC) where I completed a 300 hour government certified Thai Massage Teacher Training course. My training continued, taking me to Northern India where I lived for 2 months and graduated from Rishikesh Yog Peeth where I completed my 500 hour yoga teacher training which included Ayurveda & Yoga Therapy. I believe that we all come to this world with innate talents and that there are endless possibilities to what we can do with the life we’ve been given if we learn to trust our instincts and find the courage to move beyond the obstacles and "boxed" thinking that we've grown accustomed to giving way too much control over our lives. Yoga & bodywork are treasured tools that helped me to step out of my fears that kept me hostage to an unfulfilled life, and to uncover my own distinctive talents. My hope is that you too will find the tools to re-member you again & find what it is that makes you feel truly alive! * Buy 4 sessions and get 1 sessions FREE! * Referral Offer ~ Send one person to me and you'll receive 1/2 off your next session. Refer two people and you'll receive your next massage absolutely FREE! ​Please note that free massages are not transferable. so take that step and bring your best self to life!